"Oh Lord, won't you buy me a Mercedes-Benz". Janice Joplin's words may seem entertaining to some, but strikingly familiar to anyone who's gone through the ordeal of ushering their teenager into the world of driving. While most parents wouldn't consider buying their teen a Mercedes as a first car - at least, not a new one - the automaker is offering the next best thing. And in many ways, it's even better. Armed with statistics of teenage driving accidents and the success of a similar program in the UK, Mercedes-Benz USA is preparing to launch its own teen driving school right here in the United States. The program is aimed at turning new drivers into safer drivers through an advanced curriculum that goes over and above what's mandated by the state in order to fulfill the basic requirements for a driver's license. Going even further, the Mercedes-Benz Driving Academy is negotiating with local DMVs across the country over integrating its program with the existing mandatory process to create an all-encompassing program. If it achieves the same goals as it has in the UK, opening an advanced driving school for teens in America strikes us as one of the best safety features Mercedes-Benz has come up with yet. For the company that pioneered ABS brakes, crumple zones, stability control, brake assist and traction control, that's no mean feat. Details in the press release after the jump. 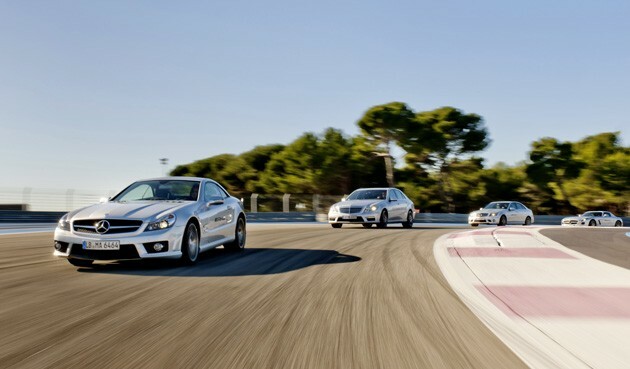 Mercedes-Benz to launch teen driving school originally appeared on Autoblog on Fri, 25 Mar 2011 08:28:00 EST. Please see our terms for use of feeds.